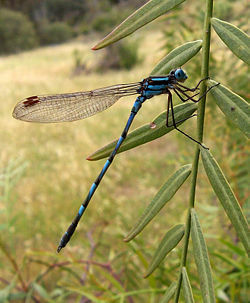 Common Blue Damselfly (Enallagama cyathigerum), an insect, one of millions of species of invertebrates. Invertebrate is a term used to describe any animal without a backbone or spinal column. The group includes about 97 percent of all animal species; that is, all animals except vertebrates, (subphylum Vertebrata of the phylum Chordata), which have a backbone or spinal column. 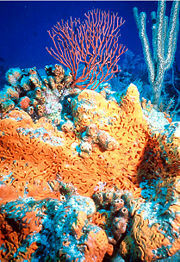 Invertebrates include simple organisms, such as sponges and flatworms, and more complex animals, such as arthropods and molluscs. Vertebrates include the familiar fish, reptiles, amphibians, birds, and mammals. Since invertebrates include all animals except a certain group, invertebrates form a paraphyletic group. Ubiquitous and filling diverse niches, invertebrates are integral to the ecology, productivity, and harmony of all ecosystems, and central to the extraordinary diversity of life that is so cherished by humans. The term invertebrate was coined by Jean-Baptiste Lamarck, who divided these animals into two groups, the Insecta and the Vermes. Today, invertebrates are classified into about 30 phyla. All phyla of animals are invertebrates with the exception that only two of the three subphyla in Phylum Chordata are invertebrates: Urochordata and Cephalochordata. These two, plus all the other known invertebrates, have only one cluster of Hox genes, while the vertebrates have duplicated their original cluster more than once. The largest subphyla in Chordata is Vertebrata. The following are descriptions of some well-known invertebrate phyla. The sponges or poriferans are primitive, sessile, mostly marine, water dwelling filter feeders that pump water through their bodies to filter out particles of food matter. With no true tissues, they lack muscles, nerves, and internal organs. There are over 5,000 modern species of sponges known, and they can be found attached to surfaces anywhere from the intertidal zone to as deep as 8,500 meters (29,000 feet) or further. The fossil record of sponges dates back to the Precambrian era. Cnidaria is a phylum containing some 11,000 species of relatively simple animals found exclusively in aquatic, mostly marine, environments. Cnidarians get their name from cnidocytes, which are specialized cells that carry stinging organelles. The corals, which are important reef-builders, belong here, as do the familiar sea anemones and jellyfish. Cnidarians are highly evident in the fossil records, having first appeared in the Precambrian era. The flatworms are relatively simple soft-bodied invertebrates. With about 25,000 known species they are the largest phylum of acoelomates. Flatworms are found in marine, freshwater, and even damp terrestrial environments. Most are free-living forms, but many are parasitic on other animals. They include flukes and tapeworms. The nematodes or roundworms are one of the most common phyla of invertebrates, with over 20,000 different described species, of which over 15,000 are parasitic. They are ubiquitous in freshwater, marine, and terrestrial environments, where they often outnumber other animals in both individual and species counts, and are found in locations as diverse as Antarctica and oceanic trenches. There are a great many parasitic forms, including pathogens in most plants and animals, humans included. The annelids comprise the segmented worms, with about 15,000 modern species, including the well-known earthworms and leeches. They are found in most wet environments, and include many terrestrial, freshwater, and especially marine species (such as the polychaetes), as well as some which are parasitic or mutualistic. They range in length from under a millimeter to over three meters (the seep tube worm Lamellibrachia luymesi). 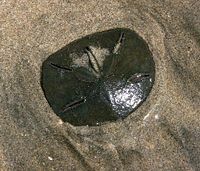 Live sand dollar on a beach. Echinoderms are a phylum of marine invertebrates found at all depths. This phylum appeared in the early Cambrian period and contains about 7,000 living species and 13,000 extinct ones. They include starfish, sea daisies, crinoids, sea urchins, sand dollars, sea cucumbers, and brittle stars. Echinodermata is the largest animal phylum to lack any freshwater or terrestrial representatives. The mollusks (American spelling) or molluscs (British spelling) are the large and diverse phylum Mollusca, which includes a variety of familiar animals well-known for their decorative shells or as seafood. These range from tiny snails, clams, and abalone to squid, cuttlefish and the octopus (which is considered the most intelligent invertebrate). There are some 112,000 species within this phylum (Feldkamp 2002). The giant squid, which until recently had not been observed alive in its adult form, is the largest invertebrate; although it is possible that the colossal squid is even larger. Arthropods are the largest phylum of animals and include the insects, arachnids, crustaceans, and others. More than 80 percent of described living animal species are arthropods (Thanukos 2006), with over a million modern species described and a fossil record reaching back to the early Cambrian. Arthropods are common throughout marine, freshwater, terrestrial, and even aerial environments, as well as including various symbiotic and parasitic forms. They range in size from microscopic plankton up to forms several meters long. Arthropods are characterized by the possession of a segmented body with appendages on each segment. They have a dorsal heart and a ventral nervous system. All arthropods are covered by a hard exoskeleton made of chitin, a polysaccharide, which provides physical protection and resistance to desiccation. Periodically, an arthropod sheds this covering when it molts. Beatty, J. A., and R. E. Blackwelder. 1974. Names of invertebrate phyla. Systematic Zoology 23(4):545-547. Colancecco, M., R. Brittingham, M. Wells, and B. MacKeverican. 2001. The Endoprocta controversy: A review. Journal of Systematic Biology at Susquehanna University 8(1). Feldkamp, S. 2002. Modern Biology. United States: Holt, Rinehart, and Winston. Maggenti, A. R., and S. Gardner. 2005. Online Dictionary of Invertebrate Zoology Retrieved December 19, 2007. Thanukos, A. 2006. The Arthropod Story University of California, Berkeley. Retrieved December 19, 2007. This page was last modified on 19 April 2014, at 16:41.